My feature on neural connectivity — known in ‘omics parlance as “connectomics” — appeared this past October in BioScience Technology magazine [5M PDF]. 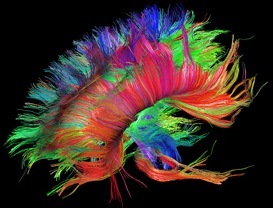 Appearing shortly after the September 2010 launch of the NIH-funded Human Connectome Project, the article looks at the technologies researchers will use to untangle the cerebral spaghetti that is neural connectivity. Researchers still cannot plumb connectivity with synaptic resolution, at least not at a whole-brain level, but they can get a 30,000-foot overview. The key tool researchers will use to tease out those tangles: functional and diffusional magnetic resonance imaging. Researchers will be collecting a battery of such data, plus behavioral, genetic and neural activity traces, on each of 1200 or so individuals. The trick will be to integrate all those data into a unified online resource that enables researchers to explore and exploit them. If the past is any guide, results could come soon. Data from the “1000 Functional Connectomes” project, a retrospective analysis of 1,414 fMRI datasets published in 2009, has already been downloaded thousands of times. Publications utilizing the data have already appeared. “There are a lot of papers around the world in preparation or in press or in current analysis that are all building on this initial bolus of data,” says project director Michael Milham. It’s not synaptic level connectivity, but for connectome researchers, it’s a good start. ~ by jeffreyperkel on February 28, 2011.